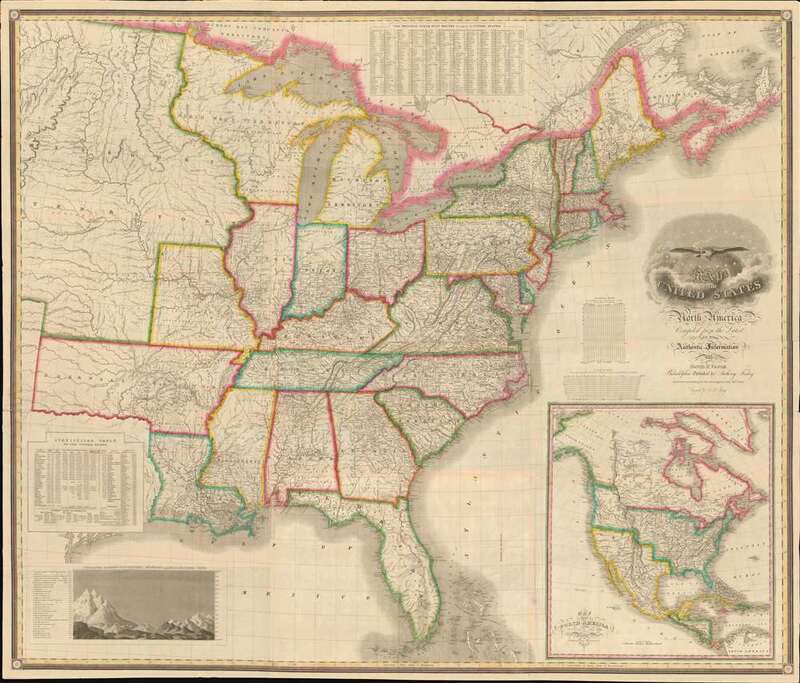 A fine pocket map example of Anthony Finley's scarce 1825 map of the United States. The map covers form just beyond the Rocky Mountains eastward to the Atlantic Seaboard and from Canada to Mexico, encompassing nearly the fully territory then claimed by the United States. Topography is rendered in profile with numerous rivers and American Indian nations noted throughout. This map falls into the somewhat vague period between the 1804-06 explorations of Louis and Clark, the 1806-07 expedition of Zebulon Pike, and the 1836 Texas Revolution. This was the era distinguished by the Mountain Men - long travelers and fur trappers who followed in the path Louis and Clark and made significant contributions to t cartography of the American west. Finley draws heavily on earlier maps of the period and with regard to the Tran-Mississippi, is particularly indebted, as noted in annotation to the 1820 explorations of Stephen H. Long along the Platte River, and then south. The map identifies Long's Peak as well as the apocryphal southern or Lewis Fork (after Meriwether Lewis) of the Columbia River. At the extreme western border, the speculative Buenaventura River is also noted. 'Texas' is identified near Galveston Bay. Most examples of this map are associated with Finley's New American Atlas which was first published in 1826, however earlier examples are known. Our own pocket map predates the publication of the New American Atlas by one year - though the plate remained unchanged - and a still earlier example dating to 1824 can be found in the Boston Public Library's Leventhal Collection. Good. Backed with archival tissue for stability. Removed from but sold with original leather binder. Some minor discolorations in lower quadrants. Rumsey 0278.002 (1826 atlas variant), 0280.002 (1827 issue). Boston Public Library, Leventhal Collection, G3700 1824 .M37x. Wheat, C. I., Mapping of the Transmississippi West, 1540 – 1861, 369.